Nicola DiCristofaro first appears in the Painesville, Ohio, area in 1909. In America, Nicola DiCristofaro was known as Nick Chriss. Nicola DiCristofaro, son of Cristofaro DiCristofaro and Maria Donata Scacciavillani, was born on May 14, 1896, at Frosolone, Italy. 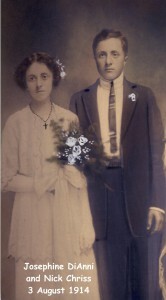 He married Giuseppa DiIanni, daughter of Gennaro DiIanni and Filomena Incoronata Venditto, on November 18, 1916 at Saint Mary Catholic Church at Painesville, Lake County, Ohio. 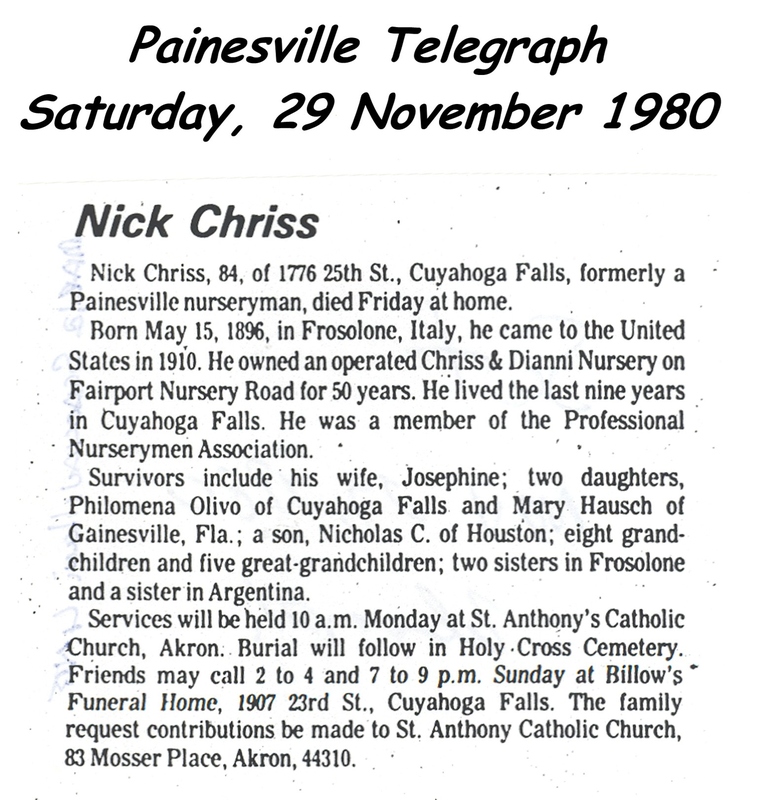 Nicola died on November 28, 1980, at his daughter’s home, 1776 25th Street, at Cuyahoga Falls, Summit County, Ohio, at age 84 from cardiac arrest. His body was interred at Holy Cross Cemetery at Akron, Summit County, Ohio. Nicola DiCristofaro, age 13, immigrated to the United States on September 20, 1909, travelling to Painesville, Lake County, Ohio with his father, Cristofaro DiCristofaro. By 1909, many Frosolonesi related to Nicola had migrated to Painesville, Ohio. 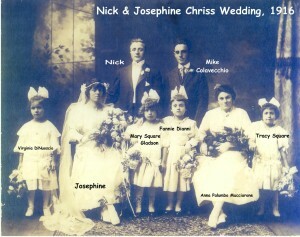 It could be said that the DiCristofaro Family was the nexus of immigration to Painesville from Frosolone. Nicola was related (by blood) to 28 other Italian immigrants to Painesville. Nick Chriss became a citizen of the United States on June 11, 1917. Nick resided at Painesville, Lake County, Ohio, when he became a citizen. He was employed by the Storr’s and Harrison’s Nursery until about 1920. 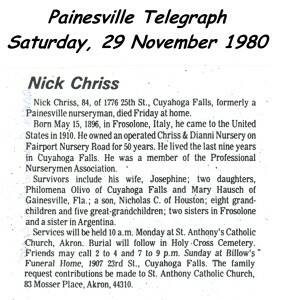 Nick Chriss owned and operated (with his brother-in-law, Felix Dianni) Chriss & Dianni Nursery on Fairport-Nursery Road in Painesville Township for 50 years (from 1920 to 1970). He moved to Cuyahoga Falls (to his daughter’s home) in 1971.